NTS Rustburg, located in Central Virginia, was founded as a place to conduct heavyweight shock testing for US Navy shipboard components. 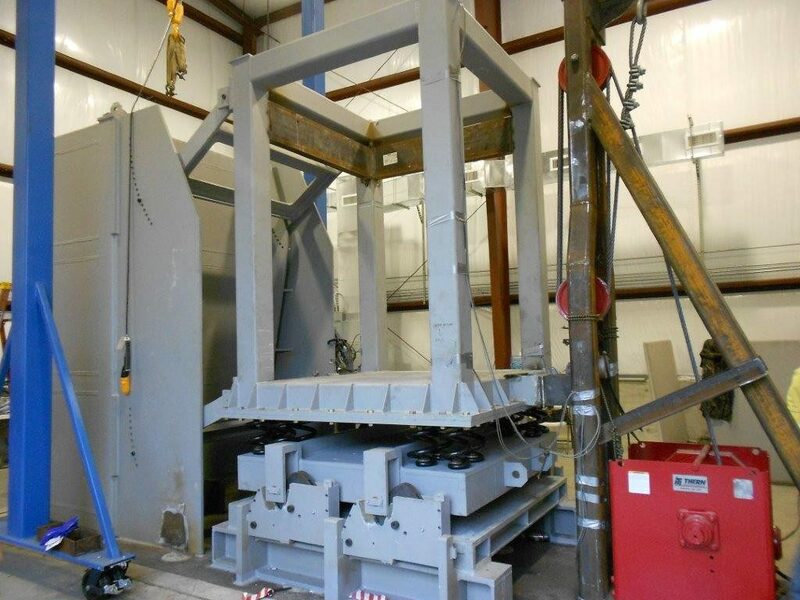 The concept of a heavyweight shock test is to install the equipment under test on the Floating Shock Platform (FSP), set off underwater explosions at varying distances from the FSP, and make observations as to the survivability of the items being tested. The controlling document for conducting heavyweight shock testing is MIL-S-901D. The fundamental philosophy of MIL-S-901D is to assure that essential Navy Shipboard equipment and systems will operate safely and reliably in a combat environment. A significant subset of essential equipment installed aboard naval combatants is deck mounted and is installed on some type of shock isolation system to improve survivability. In MIL-S-901D terms, Class II equipment is defined as equipment installed with resilient mounts between the equipment and the ship structure or more commonly referred to as shock isolated. Common types of shock isolators are wire rope isolators, arch-mounts, and numerous other shock mitigating devices. Deck mounted equipment (for surface ships) is typically mounted on the main deck and above decks, platforms and non-structural members below the main deck. 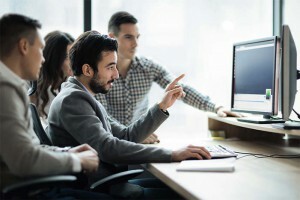 Historically, military development has been the main driving force in technology development but with the increased investment by the private sector in computers and electronics in the 1980s, military development began to lag commercial technology. As a result, throughout the 1980s, the use of commercial-off-shelf equipment (mostly electronics) on naval combatants gradually gained momentum. To keep up with rapidly changing technologies, the navy could no longer rely on the long cycle of testing and approval typically associated with ruggedized MIL-SPEC equipment. The solution was to use COTS equipment packaged in shock mitigated enclosures designed to improve shock fragility levels. Prior to the proliferation of COTS equipment, most deck mounted shipboard equipment was tested to Hull levels on medium and lightweight shock machines to Hull input (vice lower G, Deck) levels. Thus, shock isolated, Class II, deck mounted equipment presented a new dilemma for shock qualification. Hull inputs provided a higher G-input but under tested the equipment. During ship shock trials, equipment that was shock isolated and installed on decks had a higher than anticipated failure rates because of the higher displacements associated with decks and closer coupling of the isolator and deck frequencies. Initially, test labs designed customized shock test fixtures to simulate the deck environment associated with a given piece of equipment. This approach was not only expensive but often lead to compromised tests because the test fixture modal mass was typically insufficient to drive shock isolated test item. Simply stated, the simulated deck was too light to drive the test item. To address this problem, NTS designed and fabricated a universal Deck Simulator Fixture (DSF) in 1991. The new DSF provided a cost effective and technically sound approach for shock testing deck mounted, COTS (Class II) equipment. The DSF was designed to test numerous items simultaneously at frequencies ranging from 12 to 25 Hz. The design was finite element (modal and static) based and intended to accommodate a wide range of test payloads. A key feature of the design was to provide a means to adjust the deck frequency by adjusting span lengths and or adjusting the payload mass. An isometric view of this DSF design is shown in Figure 1. This design is routinely used and well over a thousand items have been tested on this DSF design. The design shows four longitudinal beams and the beams are pinned via bolted connections to supporting footstools beneath the beams. The footstools are welded to the inner-bottom of a Floating Shock Platform (FSP). Pin locations are adjusted to suit the payload and target DSF frequency. Throughout the 1990s, this was the go-to platform for shock qualifying deck mounted, Class II, shock isolated equipment in the frequency range from 12 to 16 Hz as required by MIL-S-901D. The design has been in use for so long that it is commonly known as the Navy standard DSF. As COTS equipment proliferated onto navy platforms, the test frequency deck environments continued to evolve. A number of low frequency decks in the range of 8Hz were identified on naval combatants, particularly large deck ships. Thus, the MIL-S-901D specification evolved to include low frequency testing; however, at that time there was not a viable low frequency (~8Hz) test platform in use. Sometimes, expensive and technically deficient (i.e. too light) DSFs were utilized because there were no alternatives. 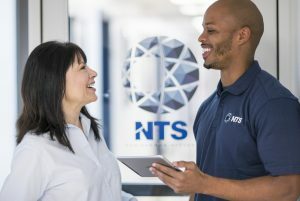 Once again, NTS stepped up to provide a timely, cost effective and technically sound alternative for shock testing Class II, COTS equipment installed on low frequency decks. The basic approach was similar to the development of the initial deck. 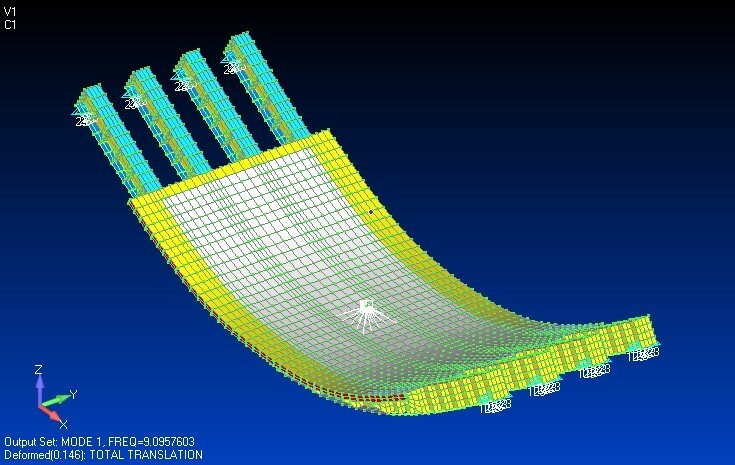 Innovative thinking that included a tune-able design coupled with finite element analyses and confidence testing lead the way for the low frequency DSF shown in Figure 2. This new design utilized existing DSF platforms to minimize costs. The design featured bolt-on extensions for the two outboard beams and offered a tune-able DSF platform for testing at both 8 and 14 Hz nominal target frequencies. The outboard beams are pinned to the supporting footstools while the inboard beams are not bolted to the FSP and provide added mass. This approach has been routinely used since the late 1990s to shock qualify Class II, COTS equipment for low frequency applications on US Navy ships. This approach for testing COTS at relatively low frequency worked well; but testing large items on high displacement shock mounts posed a problem. To address this issue in late 2012, NAVSEA issued Letter 9072 Ser 05P1/464 titled “Cost Avoidance and Clarification of MIL-S-901D Shock Test Requirements for Shock Qualification of Equipment on Heavyweight Floating Shock Platform Types with or without Deck Simulating Fixtures.” The letter introduced a number of new DSF parameters and introduced both new requirements and methodologies for defining the appropriate DSF environment. Some of the new parameters included dead mass, DSF live mass, and live mass (Equipment and Foundations). Without getting into to excessive detail, the new parameters set limits for different mass categories based on the mass Shock Response Frequency (SRF) relative to the DSF target frequency. 12 to 16 Hz DSF, the effective modal mass of the DSF is 5 times greater than the shock isolated test item. 7 to 9 Hz DSF, the effective modal mass of the DSF is 10 times greater than the shock isolated test item. In most cases, the necessary dead mass could be added to the Navy standard DSF shown in Figure 1 for 12 to 16 Hz testing; however, the addition of the mass to achieve a 10:1 ratio as required for testing in the 7 to 9 Hz range would significantly yield the DSF. NTS was again challenged to provide a new DSF solution for shipboard shock qualification. The same customer driven recipe was applied that lead the way for previous DSF designs. A tune-able design coupled with finite element analyses (see Figure 3) and confidence testing was the prerequisite for the NAVSEA letter compliant DSF shown in Figure 4. Again, the design was a modification to the existing navy standard DSF to minimize cost. The Standard design was modified by welding extensions to all of the longitudinal beams and permanent dead mass was attached to the underside of the DSF. The DSF is tuned by adding or subtracting dead mass to the top of the DSF or by adjusting the span length by changing hold-down bolt locations on all four beams. The goal for the new deck design was to have an effective modal mass in the 30,000 to 40,000 pound range and have a frequency range from roughly 6 Hz to 16 Hz without yielding the DSF. The latest DSF was successfully tested in a confidence shock test trial in May 2014 and subsequently placed in service for shock qualification test trials.